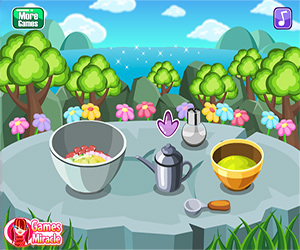 Tuna Tartar Salad is one of the best cooking games online! 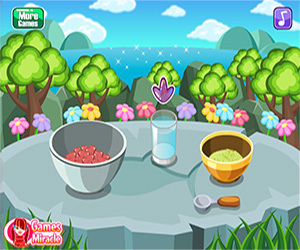 Playing it will let you learn how to prepare delicious salad with a truly tasty tuna filling. All you have to do is to follow the in-game instructions: cut the tuna in small cubes and put them in a bowl. Then make the same for a shallot and a chive. Cut the apple too! Take the wasabi powder and add water to it. Now take the shallot, the chive and add them to the tuna cubes. Make sure to add lemon juice too! Now begin to mix! Salt, oil and a spoonful of wasabi powder should be added. Add to the mix the apple, some honey and a little more lemon juice. You can add some pepper if you like it! Now mix all together. Your salad is almost ready! Take the mixture and shape it into small canapes! Then put the sauce on top of the vegetables and put them on top of the canapes. Your tuna tartar salad is ready! Isn't this fun? Play it now!